This was the flagship of the fleetwood line in 1996, to get a nicer bus than this, you would have to get a Prevost. It has the 8.3 liter Cummins with 300 horsepower, and the 6 speed Allison automatic,and an 8K diesel generator with only 476 hours. It runs and rides down the road very nicely with plenty of power. 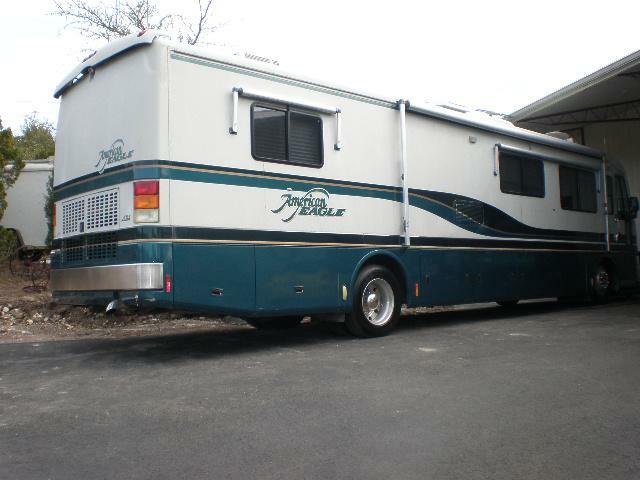 It has automatic adjusting air ride suspension, automatic leveling jacks, back up camara, tons of storage with several slide outs, beautiful walnut cabinets and white leather couches, side by side frig, icemaker, built in blender, and ice crusher, satelite tv, hidden safe, solid fiberglass roof, double pane insulated windows, and about anything else that you would expect an upper end coach like this to have. I bought this coach from an insurance company with minor damage from a small fire on the generator. I replaced the shorted wiring on the generator and repaired some minor fire damage under the hood, replaced the windshields, completly serviced everything, It is ready to go with new rear tires and 90% tread on the fronts. It does have a reconditioned title. My wife and I took it to Port Aransas over the weekend, and it performed flawlessly. I bought this coach and repaired it with the intentions of keeping it and using it, but we have bought a house in Florida, and will not have time to use both. I will deliver it anywhere for expenses. I also have an 06 Jeep Wrangler Unlimited that I have set up to pull behind it. I also have a motorcycle lift available. Call me for a full description on this beautiful coach at 512-784-3659 We just returned from a trip to Key West with this coach, and it performed flawlessly. The only problem we had on the entire trip was a flat tire on the Jeep from running over something. This is a very nice coach that is ready to go anywhere. The price has been lowered as we have bought a waterfront home in Florida and will probably be spending most of our spare time there. We have since taken it to Iowa, then to the drag boat races in Marble Falls where the generator ran for 3 days straight so it has a few more hours on it now, This is a very nice Coach ready to go anywhere in comfort. We just returned from our second trip to Iowa in this coach and it once again performed flawlessly. It also is now sporting a new set of Michelins on the front as the previous tires were kinda like me, they looked great and worked just fine, but they were a bit on the old side. Too late, SOLD, Bryan a deal when he saw it.